Thomas Kaeppeler talks about Ravensburger puzzles. Puzzles continue to enthrall kids and adults of all ages, even in this technological age. Read what Thomas Kaeppeler, puzzle and game inventor, has to say about the company he works for--Ravensburger. LoveToKnow (LTK): Please tell us about yourself. Thomas Kaeppeler (TK): I'm 46 years old and was born in Ravensburg, Germany, the town where Ravensburger's headquarters is located. I started working at Ravensburger right after college and my first job at the company was in market research. After a couple of years, I moved into international sales and became the export manager for the distributors in North America, South America, Spain and Portugal. When Ravensburger established its U.S. office in 1999, the company presented me with an opportunity I couldn't resist, so I moved to the United States to help with the start-up of Ravensburger's brand-new and first overseas-based subsidiary. I was eventually put in charge as the CEO, overseeing the company's U.S. operations. It was a once-in-a-lifetime opportunity to have such an important role in a fun industry and for a company I love. The U.S. has been "my home" ever since! LTK: Please tell us about the history of Ravensburger. TK: Ravensburger is the U.S. subsidiary of a German-based toy company and the leader in the European board game and puzzle market. The parent company was founded by Otto Maier in Ravensburg, a town in southern Germany. Maier's first game, Journey Around the World, debuted in 1884. At the turn of the 20th century, his product line broadened to include picture books, children's activity books and art instruction manuals as well as children's games and activity kits. In 1900, the now familiar Ravensburger blue triangle trademark was registered with the Imperial Patent office. The company began producing jiqsaw puzzles in 1964 and, in the same year, opened subsidiaries in Austria, France, Italy, the Netherlands, Switzerland and the United Kingdom. Ravensburger products started being sold in the United States in the early 1970s through various distributors and the U.S. subsidiary was established in 1999. Today, Ravensburger products are sold in more than 80 countries worldwide and the blue triangle logo continues to be synonymous with quality, innovation and creativity. LTK: What are some of the latest puzzles from Ravensburger? TK: Our newest offerings - including those across some of today's most popular licenses - continue Ravensburger's long-standing commitment to providing consumers with the products they love, the entertainment they crave and the top quality they expect. We offer a full range of puzzles and games for all ages and abilities, including floor puzzles, a large- format series and 18,000-piece puzzle challenges. Puzzleball®-One of our most popular puzzle designs is the puzzleball®. These Ravensburger originals feature uniquely curved plastic pieces that are numbered on the back and fit together seamlessly to create a smooth, round surface - no glue required! Each puzzleball comes complete with its own matching base stand, and we have dozens of unique designs. The latest additions to our ever-growing portfolio of puzzles include a unique range of Twilight puzzleballs for both New Moon and Eclipse, adorable Hello Kitty puzzles and puzzleballs, eye-catching Iron Man 2 puzzleballs and sports-themed puzzleballs that are great collectibles! Games-We also have new children's and family games including Jungle Jive, Make 'n' Break Challenge and a new addition to our popular line of Labyrinth games, called Labyrinth - The Duel. LTK: For what ages are the company's puzzles designed? TK: We have puzzles in a great variety of designs and concepts for children as young as 3 years old - and for those "young at heart!" LTK: What are some of the company's most popular puzzles? TK: Our unique three-dimensional puzzleball products are very popular with children, especially the globes! We also have a new range of Twilight and Hello Kitty products and those have been a real hit with the tween set too! And, of course, our wide variety of colorful 2D puzzles remains a favorite with children and adults alike! 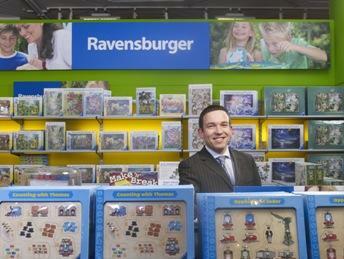 LTK: Why should consumers purchase Ravensburger's puzzles? TK: For more than 125 years, Ravensburger's products have stood apart with superior, cutting-edge craftsmanship and innovative design that engages, educates, inspires and delights children and adults . As a family company with a long, rich history and stellar reputation for built-to-last products, we're dedicated to promoting fun, learning and family togetherness - important values in today's fast-paced world. Our products are also thoughtfully created to promote important skills. While they have fun with our innovative products, children learn to think ahead, follow directions and concentrate. In addition, every Ravensburger product meets or exceeds all national and international safety testing standards. Families can feel confident about buying Ravensburger products, knowing that everything we make is not only fun and educational, but meticulously crafted from the highest quality materials as well. LTK: What other products does Ravensburger market? TK: Ravensburger has the right fit for everyone! In addition to 2D puzzles that range from beginner floor puzzles to 18,000 pieces and three-dimensional puzzleballs in a wide variety of designs, we offer an extensive assortment of games, arts and crafts sets, and puzzle accessories, such as Puzzle GLUE & GO!™ and Puzzle STOW & GO!™ We also have the WOW line of brightly-colored toys for preschoolers, which run on kid power, rather than batteries! These gorgeous products stimulate the imagination of young children, while supporting their development - from basic motor skills to more advanced social interactive role-play. WOW toys also are exceptionally well made and include a 10-year satisfaction guarantee. LTK: Where can our readers purchase these puzzles and other products? TK: Ravensburger products are sold at national retail chains and specialty toy stores throughout the country, including Barnes & Noble and Toys 'R Us, as well as on Amazon.com. Readers also may visit Ravensburger.com, where they can learn more about our impressive selection of playthings and purchase them directly. LTK: What other information would you like to share with our readers? TK: In today's fast-paced world, we believe it is important to offer products that encourage togetherness - and keep kids engaged away from screens! Our extensive assortment of puzzles, games, arts and crafts sets and toys help bring families, children and friends of all ages together and provide a fun and stimulating way for them to "power down" and spend quality time with one another. As our motto goes, "playing, learning and laughing - that IS Ravensburger!"